For more than 25 years, 122 Dutch have participated in Drum Corps International corps. Last year, two Dutch DCI alums founded an organization to support, foster and expand the continued participation of Dutch in Drum Corps International groups. The 2006 season was a successful first year for the Dutch in DCI Foundation. The group was able to expand its board, get its first sponsorships, and also build an organization with more than 50 contributing members. With funds raised, the Dutch in DCI Foundation was able to reward three scholarships to Dutch members in DCI drum corps last summer. The Dutch in DCI Foundation finished its first season last weekend with a banquet celebration. Sixty drum corps fans gathered—many in their original DCI corps jackets—on Saturday night in Huizen, the Netherlands, for a celebration of the 2006 season and the expansion of the Dutch in DCI group. Drum Corps International supported the banquet by supplying a recording of the 2006 DCI World Championship Quarterfinals broadcast. It was a great night of sharing stories and bringing back memories. The class of 2006 also received a Dutch in DCI plaque and patch for their efforts during the 2006 season. Visit www.dutchindci.com for more information. 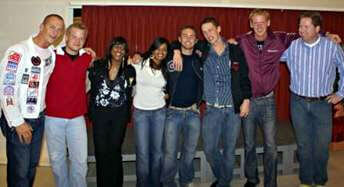 Robby Overvliet (far left) and Marc Haarman (far right) of the Dutch in DCI Foundation with the class of 2006 DCI finalists (left to right): Patrick Dam (Boston Crusaders), Esther Jobse (Glassmen), Nilanthi Baas (Santa Clara Vanguard), Frank Wienen (Santa Clara Vanguard), Harry v/d Berg (Phantom Regiment) and Alexander Giskes (The Cadets).